Tarot, Oracle or Fortune Telling Deck? 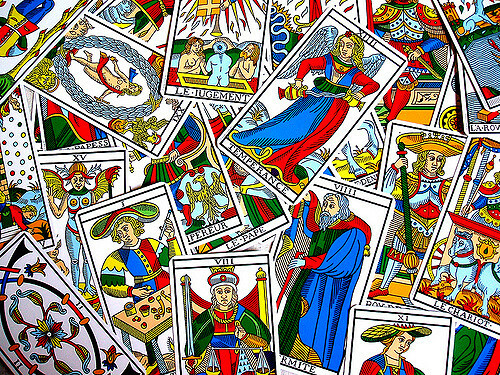 In a time where one may casually hear any means of divination referred to as Tarot, which type of deck a full size 78 card true Tarot or an oracle deck of various sizes from less than 36 to more than 52 cards is the best to select for your client’s reading situation? Having started out with a full sized Tarot deck of the Marseilles style where the minor arcana or pip cards are numbered this deck is the one which is most familiar to me. An oracle deck for me is a deck which is visual having pictures and geometric symbols not numbered or in suits like playing cards. This style of deck works for me to trigger messages from the shared subconscious levels between myself and the client. Most oracle decks were not numbered individually and the number of cards in the deck varied. A personal favorite was the 1997 Vertical Oracle by Antero Alli using 52 images created by Sylvie Pickering. In the last 10 years learning the European style of fortune telling decks of 36 cards was a major change and challenge. Having started with Lenormand from a French perspective study proved in was indeed a German concept. Moving into the Kipperkarten the benefits of using the 36 cards began to show themselves in ways that Tarot did not. Tarot I have found reads the internal aspects of the person in their environment or inside to outside. 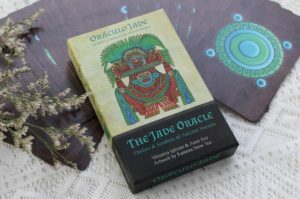 Oracle decks read all the energies in an environment or situation using symbol language. Fortune telling decks of 36 cards seem to deal with the energies in the outer world and how the person is handling them or from the outer to the inner. Clients in general want to deal with the latter how to handle the outer environment wanting to know what is coming down the pike. The 36 card decks excel at this. So it would be good when you don’t know the client at all such as an outdoor fair or doing online services. Initiates and people working in aspects of magick or the occult want to check their energies and balance so the 78 card Tarot is able to show them an internal blueprint. The Major Arcana dealing with outer phenomena, the Minor Arcana with the 4 element balance in their own system and the Court Cards with their psychological interface. One would have to know the client’s interests to select this method. Artists, creative people and those of a mystical mindset fare well when read with a symbol-visual dominant oracle. Again this works for people whose interests you know or repeat clients. Just my take on the various tools. Try them out! What happens after you open the box on a new deck of cards be they Tarot, 36 card fortune telling decks or any oracle on cardstock? Most folks like to do an unboxing or write a review for their blogs and then the new deck gets to join the others on a shelf if they are a collector or to wait until a mood strikes if they are a dilettante . If the person is a regular card reader then the deck gets placed in the rotation to be used if the energy is good. If the energy is good means in most cases if the buyer/reader “feels” a connection to the images of the deck. This is why theme and concept decks are often relegated to a certain time of year and the user never gets familiar with their cards. How does on get to know a deck of cards? My first act is to open the deck. This requires a thorough shuffle to break up the pre-formatted order of the cards. The goal of opening a deck is to get a message from the deck about what it brings to you -as a tool of divination. This ritual first act allows the deck to make the first move and speak to you. No question is needed other than your intention. The opening card is recorded. After opening the deck if it is a 78 card Tarot the layout is always the Pentagram Spread as it tells me if the energy distribution of the deck. This spread is also recorded. The first spread used varies with 36 card decks and other oracles but it is basic in all cases which means not more than 5 cards. Then what? If the deck is a good energy fit, it is time to move beyond the LWB or the guidebook which came with it. A reader has to discover what the symbology and the scenery on the cardface mean by direct experience. Reading is personal. It uses the treasure house of the Reader i.e. the contents of their subconscious (aka personal unconscious) to interpret the situation of the client. What the symbol means to a client means absolutely nothing. The layout is arranged in front of the Reader and INVERSE to the client across the table. It is the reader who functions as interpreter. 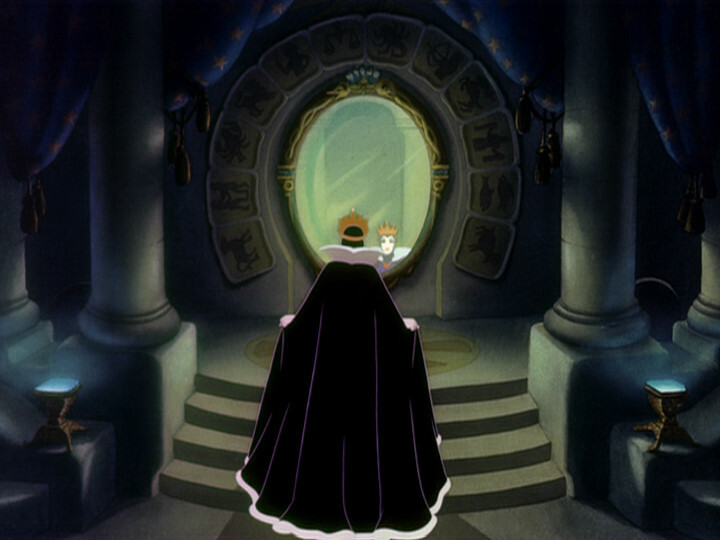 A spread is a mirror. 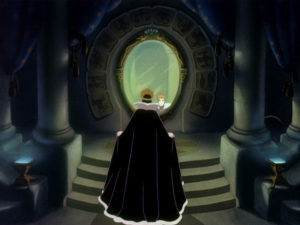 The client is the face in the mirror which momentarily looks back at us which is not our own. This is why a professional Reader immediately takes up the cards and puts the deck back together to end the session before a client rises from the chair. They may use some additional ritual techniques to “clear” each face to face reading session which ensures all the client’s energies go out the door with them. 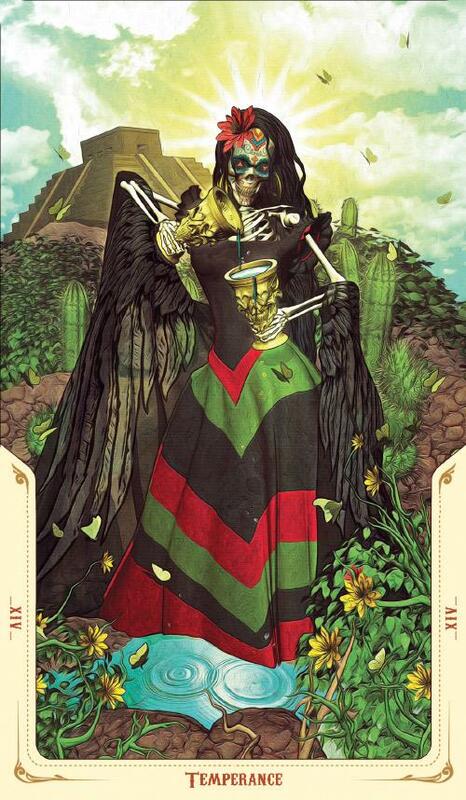 The Santa Muerte Tarot finally arrived from Book Depository in the UK who as always has the best prices! 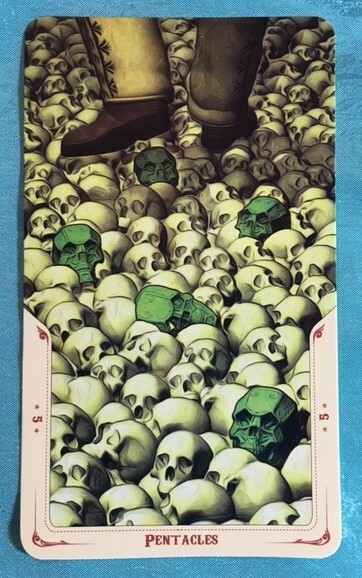 This 2017 Lo Scarabeo deck was drawn by Fabio Listrani. It came in the standard box which is quite sturdy. The cards are glossy and the stock makes it easy to shuffle them. The colors are vibrant and the scenes are not quite RWS in format. There is not a one on one correspondence to basic Tarot meanings. As a “concept” deck the subject matter “flavors” the brew so to speak. Therefore the action on the cardface is important not a rote response. The LWB gives a short blurb called Advice of the Dead for each card. It would help to look at each card as you read the notation when working with the deck. It is not for those new to Tarot, no concept deck is. The opening card for me using this deck is the Knight of Pentacles which is not shown here. The Knights are mounted on dead steeds. The Knight of Pentacles is shown in a lime green hue and has a full sack of burlap slung across his back which indicates he brings lots of information. The first layout done with the deck was a Pentagram Spread to inquire about the deck itself. This is shown in the first photo. The first card was the 10 of Wands which is a red butterfly. The butterfly is the form taken by women warriors in the Toltec-Aztec culture. They are of course women who die in childbirth and in battle who transform in Spirit and do not enter into Mictlan or the Underworld. The artist has drawn the butterfly wings of the 10’s in this deck as stylized sternums or breastbones,i.e. the bones which protect the heart. Male warriors return as hummingbirds. The concept of to “die in battle” or “warfare” can be extended in modern times to those who die a violent death. The colors and the directions are key factors in the Aztec codes used to map the world. 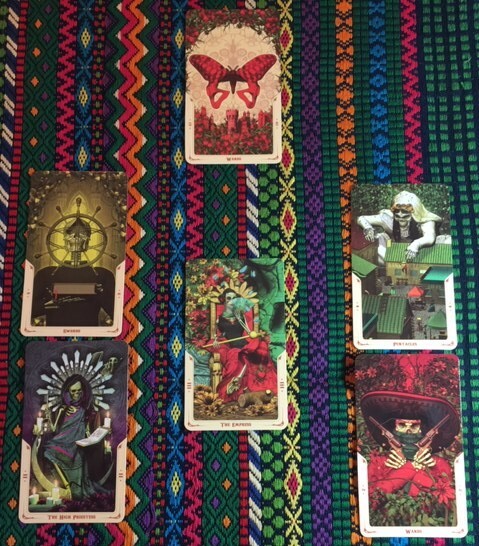 There is some variation from Olmec to Mayan to Toltec to Aztec to Mexica but in this deck it appears that Red is the color of the West/Wands; Yellow the color of the East/Sword; Blue the color of the South/Cups. The traditional color of the North or Mictlan is white but since the Land of the Dead is where the scenes take place Green/Pentacles becomes the Earth above, the land of the living which is engaged in a reciprocal relationship with the dead. Bones are seeds in the Aztec Underworld. After the creation of the Fifth Sun the cosmovision of Mesoamerica says bones were required to repopulate the Earth with human beings. The bones taken from Mictlan were then fed the blood of the Gods in order to bring them and mankind back to fleshy life. In light of this one can see why the phrase “Memento Vivere” or remember to live appears over the Sugar Skull on the deck box. Just as trees, vegetation and flowers come from seeds so does mankind come from seeds of bone. The High Priestess card connects to one’s dream life. As the scenario shows she has a key to their understanding. In fact she may have a hand in creating them. Her open book has drawings in it like the Codices of the Aztecs not words. A codex is shown again closed in the 6 of Wands also in my Pentagram Spread. The High Priestess is one of the few cards in the deck with lit candles. The Magician, Hierophant have candles as does The Queen of Wands. The Hermit of course took his lit lamp with him into the grave. The Five of Wands shows a lit match with an empty candle holder. All of these candle/light cards are part of a larger story of the absence or presence of light as awareness in the dream and death worlds. So we see a slice of “activity” in the Land of the Dead, a land both North and below our feet. Do not place westernized limits on when to use this deck. It is not just for Halloween or the Days of the Dead. Everyday the two worlds of the Living and the Dead intersect with each death and birth; with every sunrise and sunset. Working with your Ancestors is not a requirement for this deck. The Dead are the dead. They are simply people who have passed on- not just your kin but every dead man and dead woman. They are not Spirits as the Spirit of a dead man having wings flies away and cannot be confined in the Land of the Dead . Waiting for the arrival of a new deck is a practice which develops one’s patience. Ha! I am in the process of doing some looking into a Tarot deck based on an indigenous American folkloric tradition, albeit a modern one. I ordered the 2017 Santa Muerte Tarot deck standard edition by Fabio Listrani. It will be my next blog review. The card that first caught my attention is the one pictured at the left, Temperance. Just one look and I was off searching for the other images of the deck. The minors have some scenes which adhere to the Rider-Waite format, while others show images based on the theme of the deck. Not being involved in the cult of Santa Muerte, the upcoming review will focus on how indigenous American cultural symbology works in divination. As time goes on, wii find birthdays to be nostalgic, so to cheer up a purchase was made of a long eyed Oracle deck as a present to self. The Jade oracle arrived from the West Coast a few days later and being in good spirits I opened the box and was delighted by the presentation. The box is sturdy. It contains 52 large full color cards. It arrived from Goddess Ink with a large silky drawstring pouch and the LWB written in English and Spanish to tell the stories of the deities and symbols of ancient Mexico . This is a woman-centric enterprise. The 3 ladies responsible for the deck’s creation did their job well. Female deities who were maligned by Spanish Catholic writers of the ancient Codices which preserved their names and images are returned to their Divine status and given the respect they are due! The LWB though brief for each of the 52 cards works hard to explain the function of each deity or symbol breaking down the name meanings in Nahuatl, the indigenous language of Central Mexico. 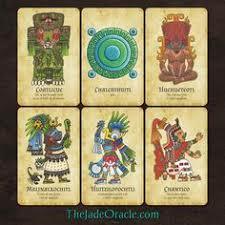 The LWB gives enough meaning to use a single card draw for any simple clear query and there is a Five Card Reading which provides a 360 degree view of the Querent in time and space using the Aztec-Mexica cultural interpretation of the four directions. I enjoyed using the 5 card layout on New Year’s Day as a part of divination rituals. It is an oracle for those who feel the call of the Earth beneath them in the Americas and feel the changes being created by the coming Sixth Sun. It is the 21st century and John Starr Cooke’s Aquarian Tarot was created for this time. It was an offering channeled through a makeshift Ouija Board using a silver dollar planchette via a group of star entities who happened to be around circa 1966 just as the heavens were starting to rearrange themselves. This Tarot has been called the Reverse Tarot and nicknamed the Hippie Tarot by some, though The Motherpeace Tarot really is the true holder of that title. 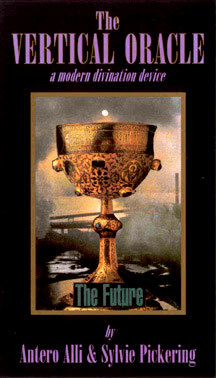 The Aquarian Tarot was and is a famous Tarot deck as was its artist John Starr Cooke the man behind the San Francisco Be-In and the Haight Ashbury hippie scene. Many influences went into the deck some obvious others not. One major influence of Cooke on the Books or Trumps themselves is the art and culture of the Mexican landscape where Cooke lived off and on. His subconscious used symbology from the Aztec-Mexica paradigm to illustrate the instructions of the Spirits he and his circle channeled. The Knower is the Old Judgement card, the date of the current millenium or 20. 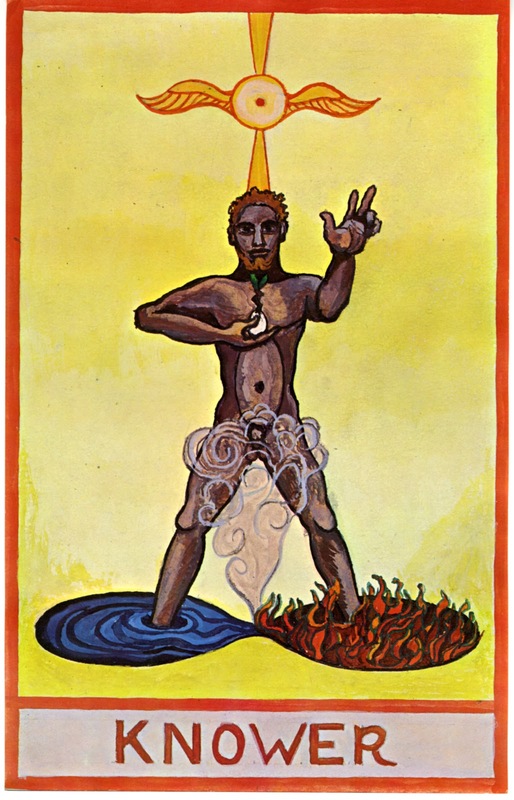 The Doer card is the Old Sun card which occupied the 19th position in the Old Order of the deck. 2019 will yield new knowledge about our Sun or rather we shall learn more about what the Sun is doing. One can use the 20-19 trump pair as: an insight into “global warming;” an indicator of increased sunspots and/or solar instability; or a predictor of a new superweapon which destroys by fire. John Starr Cooke was a mysterious man indeed! Ain’t Nothing Like the Real Thing! The Original Kippers as shown here, at first struck me as quite old-fashioned and frumpish. I had a hard time getting my eyes to focus on the scenarios. I put the cards away for a while and took a look at the Mystical Kippers a different style of Kipper deck. Coming back for a second pass with the originals I was reminded of the old style comics in the funny papers. This gave me a renewed interest in the artwork and allowed me to see each 3X3 reading like a page in a graphic novel. Applying this approach was how I stuck around long enough to learn the directional aspects of the cards. In my second phase I removed the white borders on the cards which was akin to taking down a wall between rooms in a small house to open up the space and allow the energy to flow freely through it. In this way the dynamics of the Kipper deck came alive like the storyboard of a screenplay or movie! The Kipper narrative in my favorite “Stop Card Method” is indeed a fun read. Regardless of the dated apparel and furnishings or perhaps even because of them these cards can tell the age old and modern stories of mankind’s folly. I highly recommend the Kipper deck but not for the Grand Tableau read. The beauty of the Original Kippers I have found, is in the smaller layouts. However, the Stop Card spread can take on a “largess” which rivals any GT on occasion. 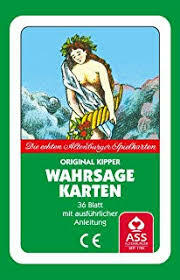 Kipperkarten energy is not “like” the Lenormand deck even though they are both German in origin and have 36 cards. The Bavarian born Kippers are utterly and uniquely themselves. They have a blunt but playful punning both visual and language based to their presentation of truth. In working with them one will come to see the attributes of clothing, furniture, and hairstyles as props in the interior rooms and backdrops in the exterior scenes which adds a particular charm- lost when changing or updating the original Kipper deck. Remember: Each variation or themed deck is a different world within the world of the original. The Major Arcana have been used in the Western system of Hermetics along with the Tree of Life to hold the contents and illustrate the structure of the Worlds. The roots of Tarot like the roots of all games have an enduring and far reaching quality which allows them to survive in the eye of the public and thus by availability to also be used as aids to memory. The reading of events to come in Tarot relies heavily on the 40 Minor Arcana as the 16 Court Cards interact with them. These 56 cards relate to energies which are coalescing and forming into manifestation. 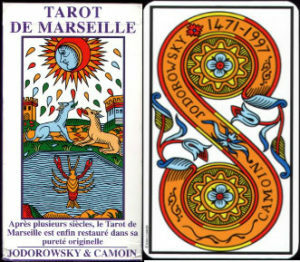 The 22 cards can be seen as archetypes, causes or knots being tied and untied which impact upon coming events. The 52 standard playing card deck is a modification of the 56 cards of Tarot’s Minor Arcana which can be used for fortune telling. The requirement to do so is a firm understanding of the 4 emblems or suits as symbols of the elements and/or the ability to read elemental pairings in a numerical field. I see Tarot as a divination tool best suited to the Initiate in a system. A divination tool reads the Querent’s energies as the central catalyst of all phenomena in the environment. For the everyday mundane “other” and outer centered queries of love and money, the 36 card decks give a far more direct response. The German 36 card games are great parlor oracles. They work well to answer all the questions a client may ask. 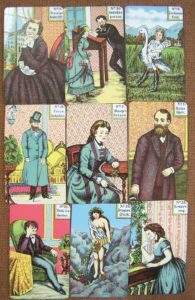 Lenormand is quite popular in the US today. My preference however is the original Kipperkarten deck with its variety of layouts and sharp directness. 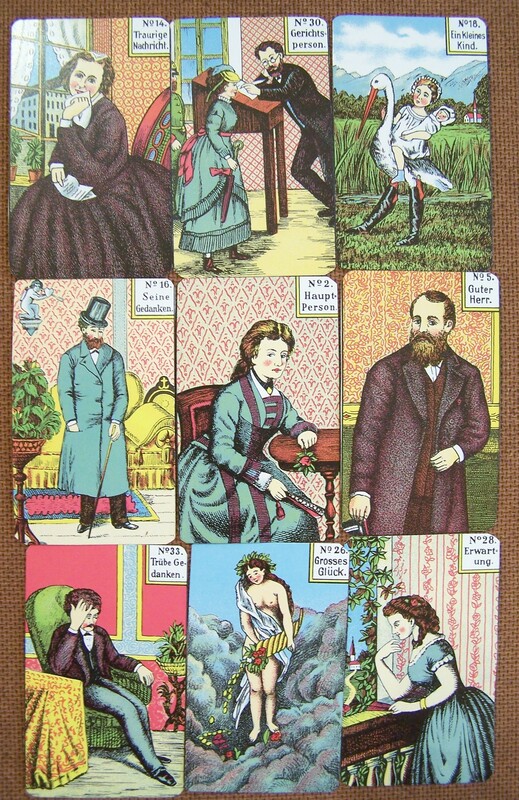 As to the Gypsy cards I do not particularly care for the images on the cards and thus there is no sympathetic bond. A reader should definitely have an affinity for the cards they read! It is not necessary to read a variety of decks. One may of course sample many decks over time in search of what works best but when it comes to advancing in Cartomancy one will find they have to limit their toolkit. The master deck is a single type of deck in a specific form which rises up out of the multitude of cards. As the saying goes “there can be only one” which the Reader truly knows inside and out. 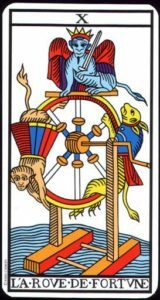 The tenth card of the Major Arcana is the Wheel of Fortune. The Wheel is sometimes identified with the Wheel of the Year. In different cultures the concept of a New Year meant different things and began at different times of the year. In agricultural or rural areas after the Harvest was in and the land cleared, the old growing season was over and a new season begun with Mother Earth getting a well deserved nap under a soon to be snow covered blanket. For some, the New Year began on November 1st, an old World Cross-Quarter Day. From All Hallows Eve, through All Soul’s Day on November 2nd was seen as the transition to a clean slate, and all debts had to be settled by then. The larders were full, the hunting season was underway with meats being skinned, butchered and hung. Sausages were being made as well as cheeses and mead. The advent of Winter in the Northern Hemisphere was the time to begin the more creative and decorative arts- spinning, weaving, sewing, tanning hides, woodturning and carving. It was a time to teach the babes and with early dark to listen to tales told by Elders which went on for nights at a time like installments of a soap opera. The Wheel of Fortune can represent samsara in a Buddhist world view. It is a symbol linked visually to the face of a clock. It shows time changing as it did last night from summer to standard time. 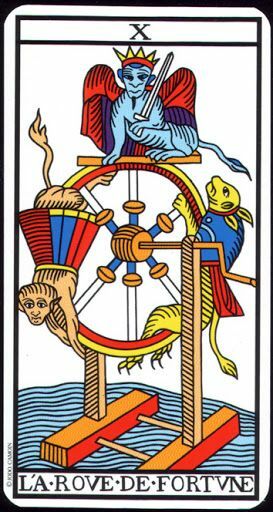 The Wheel of Fortune also shows the stages of human life and of Mother Nature. Round and round we go, to grow and prune, to turn and change, as Time blinks its Sun and Moon eyes. Many groups and lodges have used the Major Arcana to hold teachings and mark ranks. The Tarot reader on the corner who has not studied any esoteric philosophies nor participated in schools of ceremonial magic will not know anything about this aspect of Tarot. Crowley, Mathers, W.E. Butler and many other occultists have left records on the use of the Tarot in ritual but most of these papers do not spend time speaking about divination but focus on symbolic applications and correspondences. 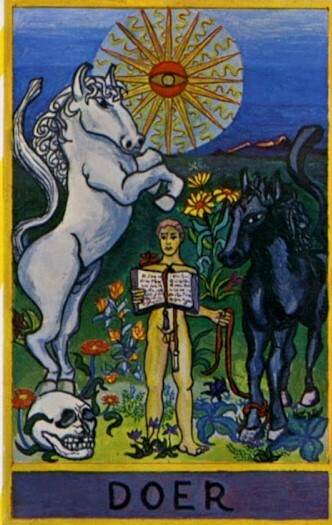 The Major Arcana cards themselves can be seen as 22 scenarios or cliches which the student can “enter” via pathworking or journeying techniques according to their degree in order to increase their knowledge of the astral plane. 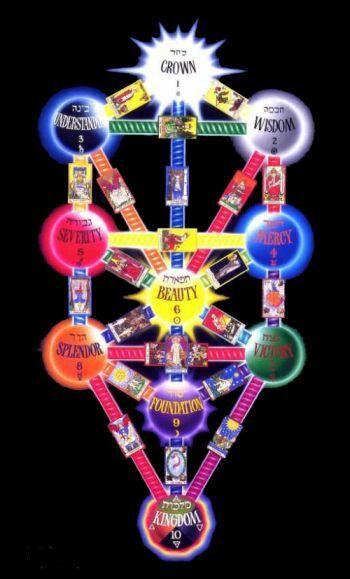 The use of the Tarot in this way is but another application of Hermetic practices in which the Tree of Life is center stage and the Tarot is used to denote paths on the Tree.